Looking for the best Cross Country Skiing trails around Susanville? Find the top rated cross country skiing trails in Susanville, whether you're looking for an easy short cross country skiing trail or a long cross country skiing trail, you'll find what you're looking for. Click on a cross country skiing trail below to find trail descriptions, trail maps, photos, and reviews. Another excellent Rail Trail experience. After all of the hoopla about this trail being named to the Rail Trail Hall of Fame, we made a point of riding it on our way back to SoCal after a trip to Oregon in June of 2016. 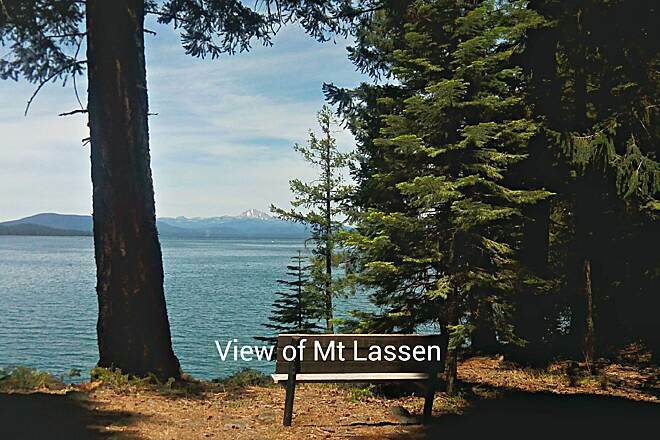 Perfect weather, beautiful river views, stately pines, and a gentle incline from Susanville made the ride a joy. The tunnels and bridge crossings add to the fun, and the forest and mountains provided enough shade to keep us cool on our morning ride. 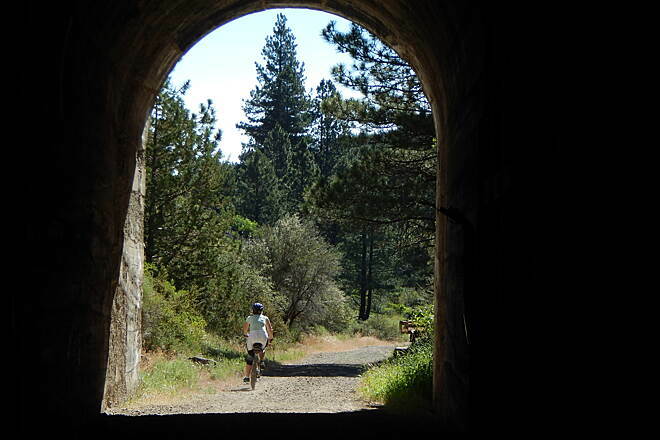 Even though the grade is gentle, it was steep enough and gravelly enough that my fifty-eight year old wife said she was done by the time we reached Devil's Corral, so we semi-coasted back down to Susanville with new pleasant memories of yet another commendable Rail Trail experience. We are traveling through 48 states. In each state, we're biking our tandem bicycle 50 miles. The Bizz Johnson National Recreation Trail looked perfect for us. But: NO! At every road crossing, the trail includes two pairs of offset gates; we'd have to dismount, go through a gate, and then re-mount to ride. After 24 sets of gates, we gave up. Great Mountain Bike Trail - Definitely Recommend! 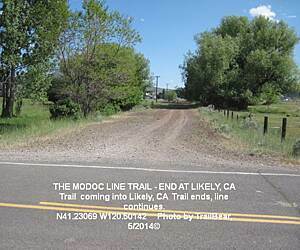 I rode the first half of this trail west from Susanville to the Goumaz trailhead and campground, and back east to Susanville. 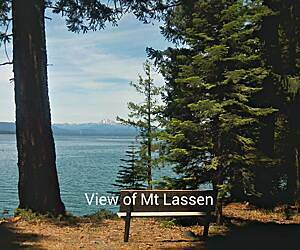 The trail features beautiful scenery in the Lassen National Forest, running along the banks of the Susan River. 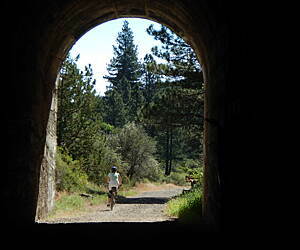 This trail is a must-ride, clearly meriting its acclaim in the Rail Trail Hall of Fame! The roughly 1% grade barely is noticeable traveling westward, and is a wonderful tailwind when heading east. A special shuttle bus the local transit authority operates runs east from clearly-marked stops in Susanville out to the rural trailheads, where you can ride the entire trail eastward on the downhill grade. We observed several cyclists doing this, and for many people this would be preferable to riding the entire trail 50 miles out-and-back in the same outing. The trail surface is packed gravel with a few rough spots and washed-out areas. Certainly would recommend a hardtail mountain bike. As another reviewer noted, the trail inexplicably ends with no markings at the Devil's Corral trailhead just east of highway 36. I spent 30 minutes walking around, surveying the area, and finally convincing myself to use a craggy singletrack dirt trail that runs westward under highway 36 and picks-up the Bizz Johnson immediately west of the highway. To much confusion, the detour is marked only on the west side of highway 36, not on the east side. The detour appears to be in-place for safety reasons, where traffic flows fast on the highway and cyclists would be encouraged to walk or bike across the highway in front of oncoming traffic. The detour singletrack trail is steep and craggy, and most riders will want to "hike-a-bike" this approximately 0.25 mile section of trail. We started at the Susanville station and went west. At mile 7, HWY 36, the trail stopped and there were no signs to tell us where to go. We finally made our way down an embankment, under the highway and up the other side; the trail under HWY 36 was narrow and dangerous. The rail/trail picked up on the other side of the highway. Coming back, we went around a barrier, opened a fence along HWY 36 and crossed the highway to the other side. 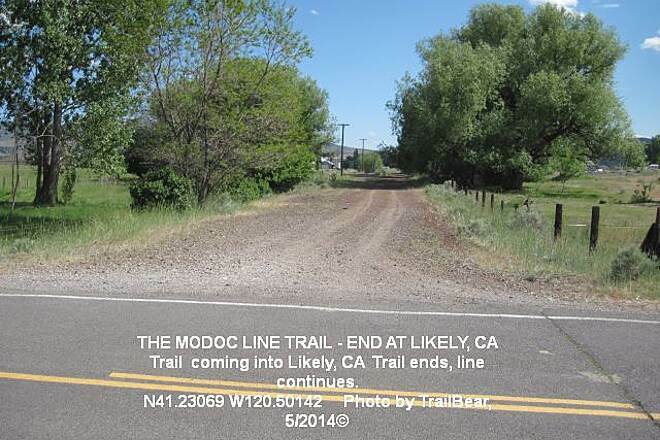 The trail was interesting between Susanville and HWY 36. West of the 36, it was straight and not very interesting. The grade going west was almost unnoticeable and coming back, when we were tired, it was a big help. The surface of the trail was good for the first seven miles and was a little rough from thereon. We are from out of town and we only took very short walks on the trail starting at 2 of the access points. Even though the brochure for the trail asks people to pick up after their dogs, it is clear that many do not. There is dog poop along the trail and is very distasteful! I would recommend that this trail become off limits for the dogs. Many owners just won;t follow rules. Dog poop and unleashed dogs! Other than that, it is a very nice trail. A great ride to finally make it to the "Bizz". We rode up from the depot 7 miles in to Devils Corral. We hit paydirt on the perfect fall weather. Had the trail to ourselves mostly. My husband and I celebrating an anniversary. We still like a decent bike adventure at 62 and 70 and this ride delivered it! The trail was easy with a slight uphill for a decent workout. All along the Susan River, crossing bridges, riding through 2 tunnels and enjoying gorgeous fall leaves and aromatic pine trees. So much fun. We drove 10 hours from So. Cal to finally experience this wondeful trail! If you want to experience nature at its best in fall, a ride that's not difficult, and glide down hill all the way back, ride the "Bizz"! Did a few segments of this trail. From Likely took CR-64 (Jess Valley rd) turned right on W. Valley road (about 1.5 miles) and about a mile past the fire station the trail meets with the road and about 200' further is a nice area to park. The trail is very soft dirt, with lots of rodent holes and little shade but it is pretty, did about 5 miles up the hill going back down was tough with the soft dirt and holes. Next drove to Madeline and picked up the trail heading north (uphill), here is it all railroad ballast and almost impossible to ride. Gave up at 2.5 miles and rode 395 back into town. Finally, took trail from Likely south bound (again uphill). A bit more packed for the first couple of miles, but still lots of rodent holes. After the gate the trail gets soft again (seems to be lots of rancher traffic digging it up) with more rodent holes. This could be a really beautiful trail but needs some work, otherwise it is better for horses and ATVs. My wife and I are in our mid fifties. We started from the Mason Station outside of Westwood. The first 5-7 miles were difficult on our hybrids. I definitely would recommend having a mountain bike. The path surface was deep gravel-type rock that our bikes kept sinking into. Picture jogging on a loose sand beach--it felt like that. Then we hit the more worn path with the 4% downgrade. The final 20 miles was like a beautiful sled run. We hardly had to peddle. The surface changed many times as did the scenery and the terrain. There were many road obstacles to steer around like trees down and huge ruts, but the majority of the path was smooth sailing. I would definitely do this again, but probably start farther up the trail and avoid the first few miles. Another noteworthy observation is that the city bus that takes you back to Westwood only runs three times a day and can carry only three bikes at a time. We took the 12:10 bus and there were five bikes wanting to get on. Some people had to leave one person behind with the bikes and go get the vehicles in Westwood. Overall it was a very beautiful and positive experience and we would definitely do this again. We just got back from the Fall Color Ride organized by BLM at the end of October on the Biz Johnson. We met at the Railroad Depot in Susanville at 8am on Saturday and loaded bikes in a truck and about 20 people in a very nice bus. They drove us up to the top of the trail at Mason Station while Stan Bale from BLM, who has been a 30 year champion of the Biz, filled us in on the history of the line and trail. The first 10 miles are slightly up grade or down through a pine forest, without much color, and you do have to keep an eye out for rocks. We never encountered any loose sand or gravel that gave us any trouble riding hybrids. From the first of twelve Susan River crossings 2.5 miles above Goumaz, the ride is easy and spectacular with lots of color and beautiful rock cliffs as you crisscross the Susan and pass through two great tunnels on your way down to the Depot. We started riding at 10am, had a nice lunch at the Goumaz rest area, and stopped many times to take pictures and enjoy the view. We were back to our car at 3pm. One Hint: after you cross the longest trestle at Devils Corral there is a sign directing you down a steep grade to pass under Hy 36. 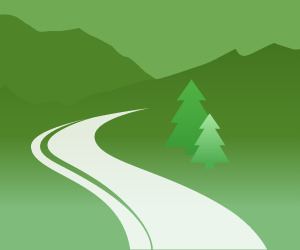 Instead, you can stay on the rail grade, open AND close a large green gate, and walk carefully across the highway and right back on to the trail. Much easier. We rode our horses on the Bizz. We parked in the dirt lot across from the Depot. The lot was full of trash and dog poop. We always pick up after our horses in parking lots. Why can't dog owners do the same. The Bizz trail is the best and Susanville is a nice town. I rode the whole trail over two days recently. The part from Susanville to Goumaz Campground is great. Excellent scenery, including benches thoughtfully placed to feature particularly nice views. From Goumaz to Westwood the trail becomes a bit rocky. Even with my hybrid, I've ridden rougher trails, but I had to keep my eyes on the ground ahead of me instead of enjoying the scenery. I did not encounter sand as a previous reviewer had, so maybe they fixed that. On this part of the trail you are in forest instead of river gorge, but still nice. I solved the rough trail problem by taking one of the Forest Service roads back to Westwood Junction and picking up the trail from there. 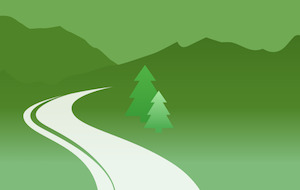 Have access to a good map if you do that as those roads are confusing. There is a good map at Mason Junction. Also, I did not like the look of the paved road from the end of the trail into Westwood. Not much shoulder, 55 mph and large pickups and RVs whizzing along. I try to avoid those roads whenever possible. So I turned around at Mason. Later I drove the road to confirm my judgement. I've ridden many rail trails and this one definitely deserves to be in the Hall of Fame.